With Christmas just around the corner, many a Nintendo gamer is perhaps asking "what should I buy?" Alas, there isn't a whole lot to look forward to in terms of new releases, so in this series we'll be spotlighting a menagerie of quality indie games that have shown up on the eShop over the years. In this edition, Mitch Vogel will be taking a look at Runbow, which recently got a physical release with Runbow Deluxe. I'll admit, while I've deeply enjoyed the library of quality games on the Wii U, it has somewhat desensitized me to platformers. Games like New Super Mario Bros. U, Donkey Kong Country: Tropical Freeze, Yoshi's Woolly World and many more have all delivered wonderful experiences that are positively top of their class, but it's also led to inevitable fatigue. As a result, I never gave Runbow much of a look when it initially came out, as it didn't seem like anything mind-blowing at the outset. I ignored all the positive reactions and great press and simply ignored it. Now that I've picked it up nearly two years after release, I've come to realize that this is one of the greatest multiplayer games in the Wii U's library. See, Runbow's biggest draw is how it perfectly manages to offer up a diverse experience of varying ideas and difficulty levels at a rapid fire pace. Is a level too hard to beat in single player? Just play some other levels and go around it. Lose to your buddy in Arena? You'll be playing another round before you have time to dwell on it. I was mildly reminded of WarioWare as I worked my way through the various modes and levels; it throws a lot at you at once and then it's over nearly as soon as it's started. Maybe it's just me, but I feel that platformers are better suited to this 30-second burst kind of gameplay. Rather than waiting for a window of opportunity or taking time to painstakingly search for collectables, you just simply react to what's immediately in front of you and hope that you made the right call. It's exciting and keeps you on your toes as you're always battling the clock, whether alone or with friends. But perhaps the most impressive part of the game is its treatment of death. Make no mistake, Runbow is a hard game in many places, but it treats death as a method of progression instead of a barrier to it. In most other platformers, you often have to redo several portions of a stage just to get another shot at the part that you messed up, and this can get frustrating through repeated attempts. 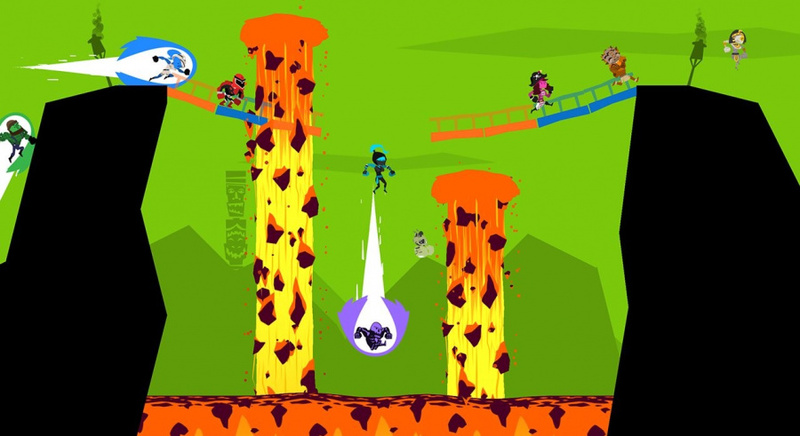 Runbow manages to sidestep this, however, with its quickfire stage design. When the whole stage itself lasts only thirty to forty seconds, it's not such a tall order to get back to where you were and try again. Because of this, the stages can be made more challenging without any detriment to your overall enjoyment. It's difficult, but fair, and it molds you into the player that you need to be in order to triumph over the game's toughest challenges. Also, getting roasted by the snarky comments on the loading screen after each death can be pretty funny, and it motivates you to be a better player. I've been rather disappointed, though, that the online scene has all but dried up. 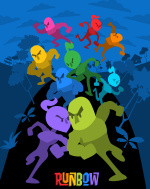 There's no better feeling then stomping others with your freshly acquired Runbow skills in a heated competition, but it's rather difficult to assemble a group of eight other individuals who are interested in playing for a few hours all at once. This is where online should come in, but I haven't for the life of me managed to get into a multiplayer game yet in any of the modes aside from the vanilla Run Mode. This isn't strictly the fault of 13AM Games, but it does make me wish that I jumped in earlier when the fanbase was more lively in this regard. Playing with friends does easily make up for the dead online, however, and this has quickly become a go-to for game nights with friends. Runbow manages to strike that beautiful zone of having a high skill ceiling and a low barrier to entry; anybody can play it and it takes quite a while to master. I've already seen Runbow's ability to reel in people that wouldn't consider themselves to be much into playing video games, and I'm quite looking forward to bringing this home and introducing it to my family over the holidays; this is the kind of thing that I can see becoming a lovely way to bond on the evenings. Overall, I've been very impressed with Runbow and appreciated my time with it thus far. The colour swapping gameplay gets a surprising amount of creative mileage in the level design, and I didn't expect to get so wrapped up in the single player campaign. Still, the true fun comes out when playing with others, which can be unfortunately difficult to do if you're trying to play online nowadays. That being said, local play is generally more fun anyway and this is couch multiplayer at its finest when you've got a full squad of nine players on board and actively invested. Runbow is my favourite indie game on the eShop since Shovel Knight (who coincidentally makes a cameo here), and I would say that it's definitely worth a look for anyone who's looking for a platformer that does something a little different. Now, we'd like to hear from you. What are your thoughts on Runbow? Do you still play it regularly? What's another indie game you'd like to see in this series? Share your thoughts in the comments below. I gave the game a try, but honestly I didn't like it. The controls didn't click with me and it felt frustrating. Plus multiplayer was annoying since there were plenty of people who would waste time taunting before grabbing the winning flag. Eh, the game was okay. As said above, I wasn't a big fan of the controls and I only have like... 4 friends who play video games. Too bad these indie games with online play are only populated for a month or so. Unrelated, BUT I CAN'T FREAKIN' WAIT FOR BOTW!!!!!!!!!!! I really liked Runbow. I bought it because 13AM games delivered a great indie, and indie devs of this caliber are rare- they need to be supported or they'll take their games elsewhere. Which is exactly why I'm buying it for 3DS. Well, that and the fact the game is perfect for on the go. I enjoyed the game. It's great multiplayer fun. I have a few friends that play on and off. Would be nice to try and setup an "online" game night of sorts for this game. Runbow would make a great local multiplayer game on the Nintendo Switch in tablet mode (the 2 screen, 4 player multiplayer seen when showing the NBA 2K game, or even something like a 4 screen, 8 player multiplayer). There is a little barrier to getting into the game. We have this on both of the WiiU's at work, and I've seen people struggle to get into the game their first couple of goes. After that people tend to love the game. LOVE. I can't recommend it enough and the DLC, which adds great story and multiplayer run levels. It is a shame about the lack of online players. We tried to get online yesterday and we were meet with an empty server. We had 4 people, but you can't start am online game unless someone jobs your lobby. I think that is a mistake that drives people away. You literally sit there with no information, not knowing if you need to wait 10 seconds or 10 days for a game to start. If they allowed you to join games in progress it would make the experience much better. They should also allow you to start a multiplayer game even if no one joins. That way you could start and there would be games going online for people to join if they came online instead of the empty feeling of wondering if anyone will join your game so you can actually start. @starcatcher77 No worries. That comment is allowed in any comment section ever. I had the same experience. Got Runbow with the Humble Bundle not knowing much about it and it has quickly become a game night favorite. Over Thanksgiving I was able to get 6 people playing at once, including my parents, and it was a RIOT. Such an addictive and hilarious game. I have a massive game night once a year with about 25 people and this will totally be on the docket. Well said. Besides looking and sounding awesome, the multiplayer is fantastic, and when I actually got into matches online it was just as fun. With so many stages in single player, I never expected to clear them all with the best possible time/score, but they go by so quickly that even when I was totally convinced that I would never be good enough to clear a stage, I suddenly managed to clear it and wondered if I should try to do even better before moving on the the next stage. I really wish I felt that game about some of the other Wii U platformers I own.. I really WANT to like Shovel Knight enough to make it all the way through.. but the stages are just waaaay too long, and screwing up feels like some sort of horrible punishment for not being good enough. Likewise, I totally want to clear Yoshi's Woolly World 100%, but even after finding all the collectibles on a stage, getting to the end with full health is stressful to the point of feeling like mild torture. Other than the Bowhemeth, every part of Runbow was exciting and rewarding, and it's easily in my top three favorite Wii U games. Hey, Mitch have you played Cloudberry Kingdom? If not, I'd thoroughly recommend it. Based on this article I think you'd love it. Runbow is great for local co-op but ran a little dry single player for me after a few hours. Having said that I'd still recommend it, fun art direction with good humour, fast-paced no nonsense gameplay and great menu setup (which really helps for a game like this). Massive variety of controller options was also a classy move. Edit: forgot to give a nod to the awesome soundtrack. Love Runbow. It's one of my favorite Wii U games. Any time I've had people over for games, I put it on if someone hasn't played it before and we always end up going for a few hours. Fantastic local multiplayer game. @CTMike No, that one looked a little TOO unfair. I have it on my PSN, I'll get around to downloading one of these days. Would you say the level design is fair? @MitchVogel there's no denying it gets crazy hard fairly quickly but I still think there's a lot to be said for just playing the first 50 levels or so over and over. The levels are extremely short, even by Runbow standards (talking all of 10-15 seconds for a lot for them) but restarting the level once you die is instantaneous - not even a transition if memory serves - and it nails that 'one more go' vibe perfectly. It's not as troll-tastic as some write ups would have you believe, in my view. Honestly, give it a half hour blast, it's well worth it! But yes, level designs (or really, ememy/hazard placment) make your runs feel smooth and flowing. Best party game i have ever had. Meaning More than 4 people!